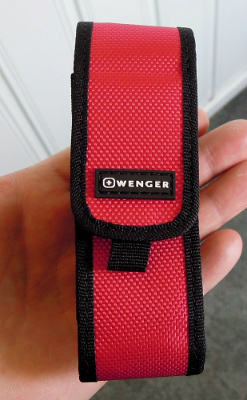 This is a nice belt pouch for the Wenger Ranger knives. It is called Case 40 red. Please take a look at my "Ranger 51 & pouch page" for more information. The red color is easy to see and in different angles it will have some color shades. It is very smart with a pouch or a case for knife carry! The knife i have in this pouch is the RangerGrip 79.821 and it fit well + it is possible to use the extra room or fold for a sharpening device. It is well made and with a quality feel to it. 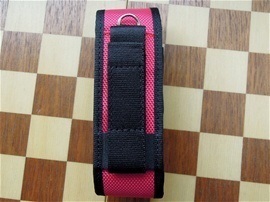 This system can be attached on a normal belt or on a life vest belt without any problem. 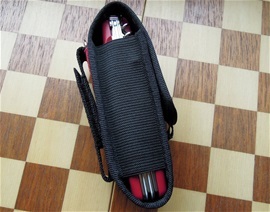 The small knives can be carried in a pocket on the body. 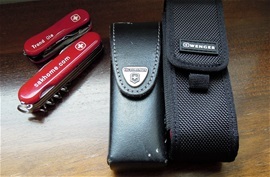 The larger multi-tools or Ranger knives can be carried in a pocket or in a belt pouch type. It is smart because this will prevent dirt or substances to get into the mechanism and you will keep the knife cleaner. Sheath or pouch carry can make it possible to reach the knife more secure and faster.